All these books are custom orders. Your book will be according to your specifications. 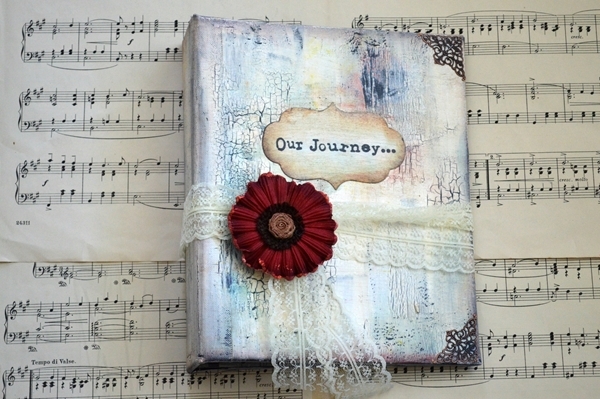 I am a mixed media and book artist, so I create each book according to my inspiration. Usually, my covers have many layers of specialty mediums, patinas and paints to achieve its texture and worn look. I believe that a journal is a very personal item and her personality have to "match" its owner's, in order to be a valued friend and not another book left forgotten in a library shelf.. This is the reason why I am asking a lot questions - I am trying to imagine the perfect book for you. However, although I will follow your recommendations the creation process wil be mine alone. I use natural pigments when possible, my materials are the finest in the market, researched and bought from all over the wold, and I protect the artwork with ecological varnishes and sealers to ensure the vitality of colors for many years to come. I bind my books using strong 3-ply Crawford's Irish linen thread . This listing is for a journal with size 17,5 x 25,5cm ( 7 x 10 2/8 inches). - All pages will be hand stamped and distressed according to the color theme chosen. No books of mine are exactly the same and each one is accompanied with its own certification of authenticity signed and sealed. I will pack your book very carefully and send it to you by registered mail, so you can track its journey to you.